A classic dessert, repackaged for breakfast. In a bowl, mix milk, pumpkin, egg, butter, and vinegar. In a separate bowl, combine flour, brown sugar, baking powder, baking soda, allspice, cinnamon, ginger, and salt. Stir into the pumpkin mixture just enough to combine. Do not overmix. Heat a lightly oiled griddle or frying pan over medium-high heat. Pour or scoop the batter onto the griddle, using approximately ¼ cup for each pancake. Brown on both sides and serve hot. 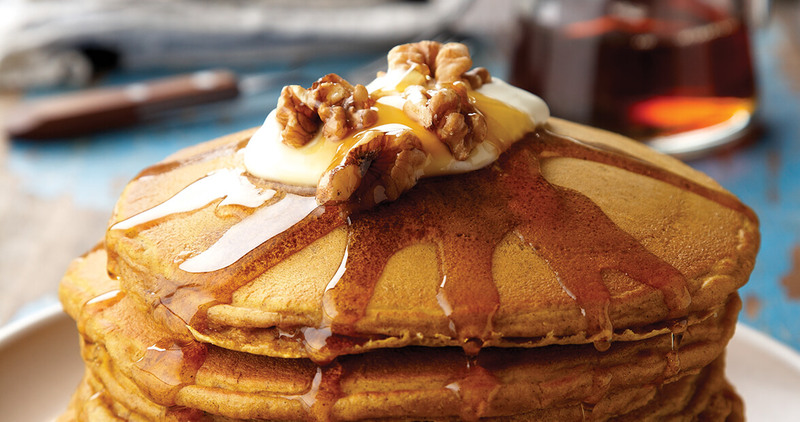 Top with whipped cream, toasted walnuts, and maple syrup, if desired.